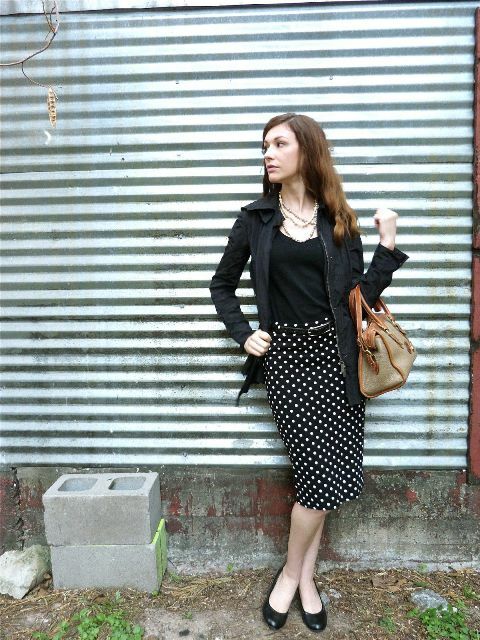 We continue to share with you adorable skirt outfit ideas, and today it’s time for polka dot pencil skirts. I don’t know how about you, but from my point of view such skirts are flirty and fun, eye-catching and classic at the same time. So no doubt every woman should have this item and create a feminine and elegant outfits with it. It’s easy to guess that the most popular color combination is a black and white one, but you can find a black and gray, navy blue and white, red and white skirts. Now you can scroll down to see all ideas that we have collected just for you. If you want to create an elegant and gorgeous look, then you need to find a black turtleneck and combine it with a gray high-waisted pencil skirt with black dots, oversized sunglasses and a black clutch. 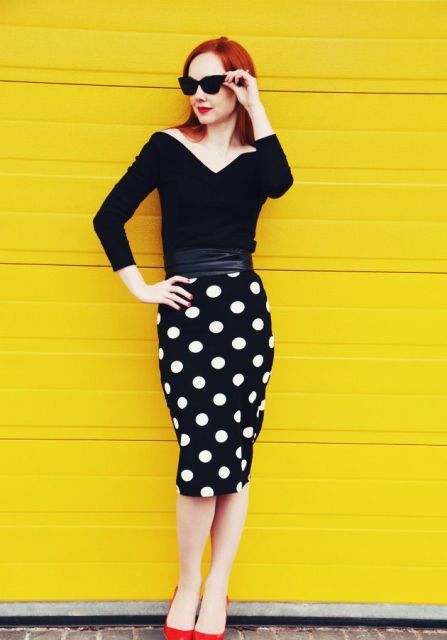 Or you can mix a black off the shoulder shirt with a black and white polka dot midi skirt, a black leather wide belt, sunglasses and red pumps. If you are ready for something flirty and eye-catching, then you can try to repeat a combination with a labeled sweatshirt, a shirt, a gray and black polka dot pencil knee-length skirt, a hot pink clutch, sunglasses and hot pink pumps. Don’t be afraid to combine printed pieces of clothes together. For example, you can take a printed loose blouse and pair it with a navy blue and white polka dot pencil midi skirt, an olive green midi trench coat and white ankle strap shoes. Or you can choose a leopard printed shirt and mix it with a polka dot skirt, a gray blazer, a necklace, white and golden pumps and a black and white bag.